With each passing day my confirmation that I like clear and simple things is confirmed! Every time I try to pursue or do something that is not straightforward and clear-cut, I find myself transformed into this tightened-up bundle of worries and emotions... For I am no longer sitting in control, in the front seat, but, somehow, kicked to the back-seat to endure an unknown ride! Of course, that doesn't mean the final destination is not a good one, but the ride is not a very enjoyable one for a systematic and straightforward human being such as me. It gets me out of my comfort zone! My latest project that further confirmed this, is my idea to move dish-away from Blogger to Wordpress because of the powerful tools that Wordpress presents that will enable me to add a feature to allow members to add their recipes. So for the past 10 days, I tried navigating my way around Wordpress; now you know why I didn't post a recipe this week. Yes, Wordpress is a powerful platform with many positive options, but I didn't have a positive connection with it. I didn't find it simple or clear, what I found is that it didn't fit with my personality! I was a little disappointed that I will have to wait for a while longer until I can develop the features on this blog as I want, but I was relieved that I took a decision that will enable me to be true to my character and self. 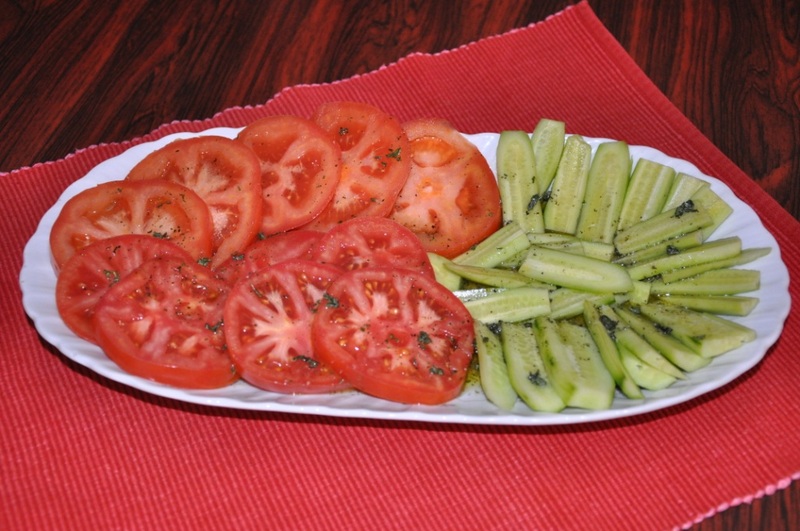 To celebrate this, I decided to prepare and post the simplest salad ever: Mediterranean Tomato-Cucumber Salad. Don't be discouraged by its simplicity, it will surprise you with its strong flavor and appeal to children. Cut the tomatoes into large rings. Arrange tomatoes and cucumbers in a flat dish in a nice display next to each other. Another way, if you want to use a deep dish, is to arrange a tomato layer and top it with cucumber layer, then another tomato layer topped with a cucumber layer. Mix the lemon juice with the vinegar and salt well until salt is dissolved. Add the olive oil, black pepper and crushed mint leaves. Mix well, then pour over the tomatoes and cucumbers. Cover the Mediterranean Tomato-Cucumber Salad and refrigerate for an hour before serving. This will let the flavors of the dressing soak the tomatoes and cucumbers. Hope you enjoyed today's easy recipe: Mediterranean Tomato-Cucumber Salad. Bon appetite. How about you, do you like simple things, or do you prefer more complex things that offer you a challenge?